Two police officers were tried and found guilty of trafficking anabolic steroids as they made a killing selling them to their fellow cops. Edmonton, CA — Two Edmonton police officers were found guilty this week for running a highly profitable steroid ring—selling anabolic steroids to fellow cops. Edmonton Police officer Greg Lewis was tried and convicted on multiple counts of trafficking a controlled substance while he ostensibly protected the people of Edmonton. “Given (the) convictions on two of those charges, disciplinary proceedings under the Police Service Regulation will now be initiated,” said EPS spokesperson Carolin Maran. In their decision, however, the court somewhat justified the cop’s use and sale of steroids as a means of being fit. While reading his decision, Brooker detailed how Lewis, 36, was a “proponent of fitness” who had a reputation for knowing where to find steroids, reported CBC. Lewis has been on unpaid suspension since he was busted in March of 2015. After a two-year investigation by the Alberta Serious Incident Response Team, Lewis was finally charged. During the trial, Lewis admitted to both using steroids and selling them to his colleagues. What’s more, his fellow cops even testified that they bought the drugs from him. The other officer charged with Lewis, Darren French, pleaded guilty in June 2016 to two counts of trafficking Stanozolol and Methyl-1-Testosterone, according to CBC. While Lewis’s sentencing has been delayed until further notice, French received a slap on the wrist for his role in the ring. While it is certainly the belief of the Free Thought Project that anyone should be able to put anything into their own body without persecution of the state, police officers using anabolic steroids—which included a host of aggressive side effects—is an extremely bad idea. These Edmonton cops are not alone either. As the Free Thought Project previously reported, Darrion Holiwell, 51, was arrested and charged for not only taking steroids but dealing them to other SWAT deputies on the force, as well as people outside the agency. 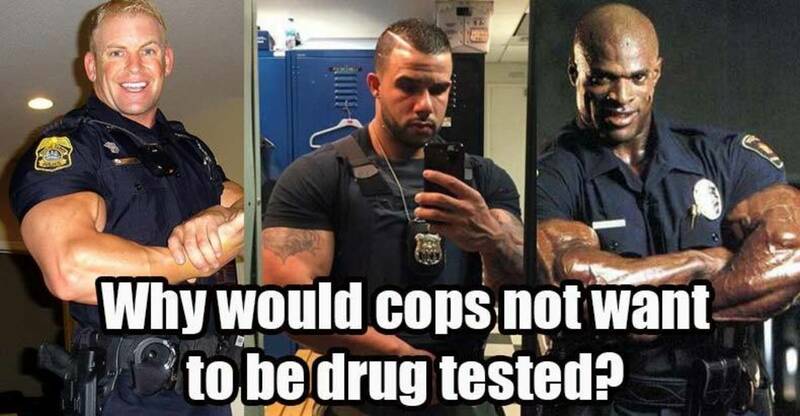 As Alternet pointed out, the cases of cops using and selling steroids are anything but isolated. In June, a Jeffersonville, Ind., cop, Anthony Mills, resigned after pleading guilty to possession of steroids. His attorney told the media that Mills did not consider steroids to be illegal drugs. This spring, authorities in Edmonton, Alberta, revealed that a handful of police officers had been involved in the use or distribution of Stanozolol, the steroid commonly sold as Winstrol. More than 30 officers in Edmonton have been implicated in steroid use in the past few years, according to press reports there. In January, a Portland, Ore. cop who faced firing for a positive steroid test was allowed to resign. Last fall, a scandal rocked police in the Augusta, Ga., area when a man arrested for steroids possession gave authorities a list of steroid users among local law enforcement officers. At least one deputy resigned; authorities denied that the list included as many 30 others. Also last fall, the Miami New Times revealed that Miami-Dade police officers had been customers of Biogenesis, a South Florida steroid clinic at the heart of professional baseball’s ongoing doping scandal. The dangers of cops taking steroids are obvious, as the rage associated with their use can become uncontrollable. All too often, we see police officers immediately escalate situations to violence when de-escalation would have been far easier and safer. Steroids could be the reason. Cops on the juice feel indestructible, as if they have superhuman strength.